If that title isn’t a contradiction in terms, I don’t know what is. I associate trompe l’oeil with fancy murals and beautiful chateaus. Not with farmhouses, and certainly not with mudrooms. However, in my recent mudroom makeover, I created the look of barnboard in an attempt to dress up basic boring slab bi-fold closet doors. The closet doors are one of those projects that were added on to the makeover because I had to. The doors were coated with an anaglytpa wallpaper that had been painted. It did not match up to the rustic feel I was going for, so I decided to strip it off the doors. Doing that revealed why the doors had been wallpapered in the first place: layers of badly chipped paint that I couldn’t simply paint over. I had seen Minwax Classic Grey stain on the dollhouse Jessica made over at Running With Scissors and was impressed by how she was able to replicate weathered wood, so I decided that was the way to go. 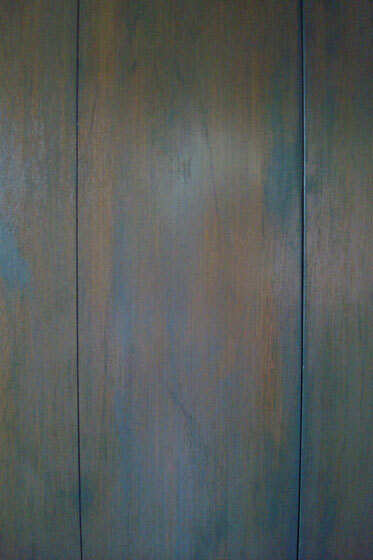 However, just like when I was painting trim in the mudroom, the motivation to strip the closet doors was hard to find. After a few months of procrastinating followed by many, many coats of stripper and lots and lots of sanding, my closet doors were finally naked. Perhaps because of all of the stripper I had to use, I found it difficult to get an even coat with the stain, but I think that works in my favour, as barn board is made up of varied tones. 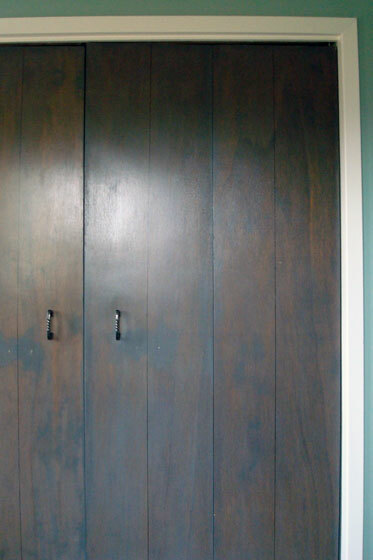 Then to make my flat bi-fold closet doors look a little bit more like weathered grey boards, I took a black marker and drew vertical lines down the middle of each door to make trompe l’oiel planks. If I’d really been serious, I could have routed a very shallow gouge down the middle of each door, but I was just going for the feel of barn board and not trying to replicate it too closely. I reused the black metal pulls that were on the doors originally, turning them vertical to look a little more barndoor-ish. Remember, this makeover was all about cheap and cheerful and working with what we had. So there you have it. Magic marker barn board planks. Or if you want to be fancy, trompe l’oeil barn board planks. Not a bad way to dress up basic flat panel bi-fold doors. And there you have the last project of the mudroom makeover. Thanks for all of your great comments and suggestions throughout these posts. It’s so great to finally have one room done. There are lots more ideas on how to make flat doors more interesting on Pinterest and all over the blogosphere. What are some of your favourites? Do you have barn board (real or fake) in your house? Anyone have any suggestions of the best paint strippers to use? I’m not sure the brand I chose was the most effective, because I felt like these doors took an awful lot of stripper. Any stripping horror or success stories to share? 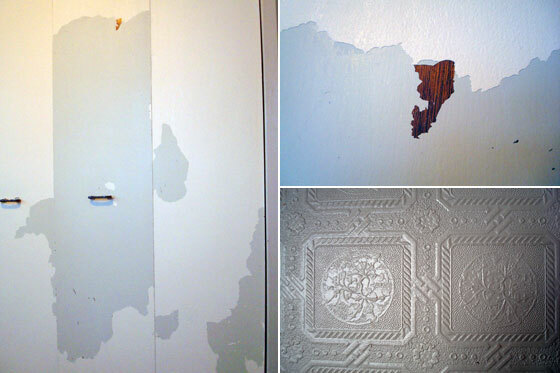 Have you ever “faked it” and made your own trompe l’oeil? I’m impressed by how these turned out! I especially like the little detail of turning the handles on their sides. This project is a great example of working with what you’ve got. I always prefer to save $$ and reuse if I can.